An view of a road in Langrug, displaying the contrast between the community and the mountain backdrop. Our project will be continuing and expanding on the work done in the WaSH facility established in 2011. From the beginning of this project, students have worked closely with the Community Organisation Resource Centre, or “CORC” and community members to maintain and improve the operations of the facility. This project has made great strides since its inception. The project teams have built a unique facility that addresses a major issue of sanitation and hygiene while also attempting to enrich the social and educational aspect of the community. In order to continue to advance this program, the issue of facility sustainability must be addressed. Our advisors, CORC and community leaders have discussed possible solutions to this problem and concluded that the facility must have a self-sustaining component in addition to municipal and corporate support in order to continue achieve further progress. To achieve this the facility would need continuous revenue streams to support daily expenses and caretaker salaries. Through this project the team hoped to create a replicable management and business operations model that could be used nationally in similarfacilities. Throughout the team’s first few days in the community, we hoped to observe the everyday operations of the WaSH facility, gain a basic understanding of the current operations, and begin to establish a relationship with our co-researchers. 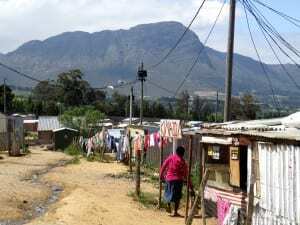 Langrug is a large informal settlement located in the Municipality of Stellenbosch. This community is home to almost 5,000 individuals and has experienced countless issues with water and sanitation. Upon arrival in Langrug, the team visited the WaSH facility that was established, with the help of a WPI project team, in 2011. Currently the facility is maintained by two caretakers and houses a salon operated by a local woman. This facility is still in good condition and has been well maintained for the past three years. This facility is an area where community members may access clean toilets, running water and health programs. The facility also acts as a meetinghouse for the community and is the operation site for the community savings group. In the past year, the community members, along with Touching the Earth Lightly, have begun building a new facility in the Zwelistha community. Zwelishta is a sector of the Langrug informal settlement and currently has little to no access to toilets, running water or electricity. The facility under construction will be larger than the Mandela Park facility and will house a number of additional amenities and services. This building will provide access to water, toilets and community space much like the other facility. However, this facility will also include a crèche for small children and possibly a health clinic. This new facility would be a huge asset to the community because there is a severe need for these services to improve the quality of life and livelihood in the community. After departing St. John’s Lodge at 8:45 am, our group rode with the WaSH-UP Services Group and arranged to pick up Sizwe from the airport so that we could meet him prior to arriving in the Langrug informal settlement. He was an interesting character and he seemed more interested in learning a little about us individually before discussing our projects and expectations. As we rode through what appeared to be a middle-class residential area, we noticed some dirt roads, shacks, and construction coming up ahead. After riding in a van for over an hour, we finally set eyes on the informal settlement that we had heard so much about. For our very first experience with informal settlements, our groups arrived on site at the Langrug WaSH-UP facility. The first person to greet us was Mama Poto, the caretaker who was on duty at the time. After greeting us with great excitement, she told us how the facility functions and how the caretakers split the hours of work (Mama Poto works the morning shift and Mama Nomthandazo works the evening shift). Mama Poto explained to us that the facility was not currently operating because the construction was interfering with the water system for the community. The construction was said to only last a few days and the facility should be back to normal by the end of the week. The facility was different than we had originally expected. The ample amount of plants, the cleanliness maintained by the caretakers, and the high level of security was surprising to our group. Shortly after arriving in Langrug and after our initial introductions, our group walked up the hill to the next stop on our tour: Zwelitsha. Zwelitsha is another section of the Langrug community that is located about a five-minute walk up the hill. When we walked into this part of the community it was clear that a lot was going on! Community members were scattered through the standing foundation of the new WaSH-UP facility. There were people digging trenches for pipes, hammering planks together and using saws to cut new pieces of wood to add to the scaffolding. Once we were able to observe the construction in action for a few minutes, we were introduced to a whole new cast of characters. The first person to be introduced to our group was Andrew. Andrew, a designer and builder from Touching the Earth Lightly, was a man of few words but he was able to explain to us a little bit of where they were at in the construction. Andrew also explained to our group some of the problems that they were encountering with the construction of the new facility. One of these big problems is grey water runoff and sewage drainage. After getting an overview of the construction, the other members of the community who were present introduced themselves one by one to each member of our team. These community members were all women who were extremely happy and excited to greet us and seem genuinely enthusiastic. Tandaka lead a discussion between the community members and our group, acting as a translator to help the two groups understand each other’s backgrounds. While we were being introduced the women in the group kept telling Tandaka that they were so happy that they were here and this was something they have awaited for an entire year. However one of the women said she was happy we were there but she was wary because she knew when we left in two months it would be very sad and there would be lots of tears. It was quite impactful for our group to hear the strong emotional ties these community members have to the project center and how much they really enjoy having us here. It was also a thought that we hadn’t really considered before. What will we feel when we leave? After this discussion Nobathembu, a community member, explained the plans for the operations of the Zwelitsha facility using a small-scale model of the building. It was incredibly cool to see the foundation and see the substantial progress that had been made. Our group also began to see that the community was putting a great emphasis on this particular center. They were very excited for us to be here because we could act as engineers and help build the new structure. The mood of the group shifted at this point in the meeting. Both WaSH teams became very nervous that our projects would become something entirely different. We did not plan to come and work at the Zwelitsha facility and this was all very overwhelming for us to hear. Panic began to grow as the conversation carried on. After a long day of information overload it was time for the teams to head back to the lodge. The general feelings of exhaustion and apprehension were palpable in the ride home. All of us were concerned at where our projects would go and what were the challenges we would face. On top of all the confusion, we were all still trying to absorb the extreme poverty and low standard of living that we had just witnessed firsthand. It was certainly shocking to experience the setting in reality rather than through pictures. After a first day full of surprises and a nervous panic spreading throughout the two Langrug project groups, a meeting was called back at St John’s Lodge between the two groups, the advisors, and Sizwe. This meeting was a great opportunity to express our concerns and hearing Scott reassure us that our projects are important to the Langrug community was relieving. After meeting with Scott, Steve, and Sizwe, our two groups combined to prioritize which projects and tasks would be most beneficial for the Langrug community members. We also created a plan for meeting with the community members the next day to increase our chances of establishing strong relationships. We decided to play a name game and have everybody say a few things about their personal lives. On our second day in Langrug, we traveled back to the new WaSH facility to meet with the community members. Our advisors, Scott and Steve, were also in the field and introduced themselves to everyone, although most people recognized them and were extremely excited to see them. We then went into the Langrug WaSH facility to complete an icebreaker activity. We brought paper, markers, crayons, pencils and sticker to decorate nametags. This was done so that we could learn the community members’ names better, and also learn something about them. We spent a good amount of time creating the nametags, during which time we grew closer to the community members and shared jokes. Over the next hour or so, we went around in a circle sharing our names and anything we drew on our nametags. This activity was very successful because it provided a means by which to share some personal information with each other; whatever we drew on our nametags was important to us, and we shared why with the group. We all felt that this was one of the best activities we could have chosen to do, because it started to form the relationships between us and the community members by having us all open up to each other. The topics we discussed as a group proved to us all that we are much more similar than we sometimes believe. Many of us drew hearts on our nametags, bringing up the topic of love. We all agreed on the need for love, and tried to understand why we always want more of it. Stephanie and Heather drew owls and black cats, respectively, on their nametags, bringing up the discussion of superstitions. Sizwe told us that people here believe cats to be elements of witchcraft, and we quickly added that a similar superstition is shared in the U.S. We also shared stories of using sage to cast out bad spirits, and it was interesting to all of us that this was such a topic of similarity. 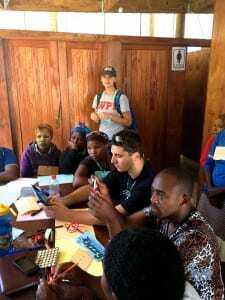 Overall, this activity greatly benefited our team and the project as a whole by helping to bring all of us closer and realize that we are not as different as we think. Our team thoroughly enjoyed the morning/early afternoon with the community members, and left Langrug feeling like we had made a lot of progress in understanding the community members better. Our first two days in Langurg were eye-opening, confusing and yet uplifting. Even after spending only a few short hours in the community our team experienced quite the whirlwind of emotions. Our initial introduction into the community was extremely jarring. We were excited to begin work, yet it seemed right from the start that there were many issues and barriers we would need to overcome. Although this left us slightly discouraged and stressed, we were able to make sense of these emotions and turn things around rather quickly. By maintaining optimism and really putting forth a good effort we were able to establish a sense of open communication and began to establish our relationship with the community members on a much more personal level in a short amount of time. This connection really brought a sense of security to the team and has made us feel far more confident in the pursuit of our project. Even though the first two days were emotionally draining and frustrating our team is optimistic and we look forward to moving onward in our efforts.